Hollywood Records recently announced today the signing of McClain Sisters, comprised of China Anne McClain, star of Disney Channel’s hit series A.N.T. FARM, and her sisters Lauryn, and Sierra, a trio whose captivating talent and undeniable star quality will inevitably end the music industry’s decades-long quest for a best-selling girl-group. McClain Sisters lead singer China Anne McClain is an acclaimed young actress who, in addition to starring in Disney Channel’s A.N.T. FARM, a role for which she received a 2012 NAACP Image Award nomination, also starred in the House of Payne television series and the movie The Gospel. The talented trio’s mounting popularity is evidenced by accomplishments such as the A.N.T. FARM soundtrack’s soaring debut at #29 on the Billboard 200, which includes tracks by McClain Sisters “Electronic Apology” and “Perfect Mistake,” as well as notable acting roles in the Tyler Perry feature film Daddy’s Little Girls and a recent performance for more than 72,000 at RODEOHOUSTON 2012. 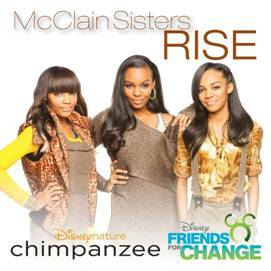 “Rise,” written and performed by McClain Sisters after being inspired by Disneynature’s feature film CHIMPANZEE, is the latest Disney Friends for Change anthem. With the motivating lyrics “Together we can do anything,” the song captures the central message of the program: when kids and families work together, they can inspire each other and their communities to make a lasting, positive change in the world. “Rise” is the fourth Friends for Change anthem to be released with a benefit back to the Disney Worldwide Conservation Fund. This contribution marks nearly $1 million awarded through the music campaign to charities working to protect the planet and conserve nature for future generations.